According to recent data from stateofobesity.org, adult obesity rates in the United States exceed 35% in 5 states, 30% in 25 states, and 25% in 46 states. 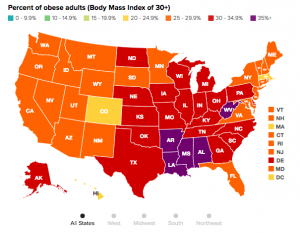 West Virginia has the highest obesity rate at a solid 37.7%. This data is slightly skewed, however, as West Virginia is one of the smallest states with a population of 1.8 million. This still means that roughly 678,600 people in WV are obese. 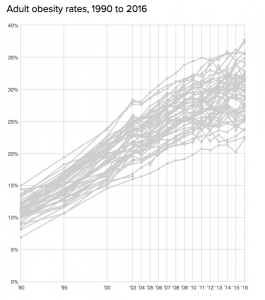 One of the few states seeing a decrease in obesity is Kansas. Colorado has the lowest obesity rate at 22.3%, and along with Minnesota, Washington, and West Virginia is also one of the more stable states. Below are some of the graphs from the study. Home Uncategorized Adult Obesity in the U.S.